Subject description: Can I make it better? The goal was to see if I could ramp up the "elegance factor" by getting rid of the 4001 CMOS logic chip. What got me thinking along these lines was the exceedingly clever idea from Bernie Hutchins in Electronotes Application Note #200. 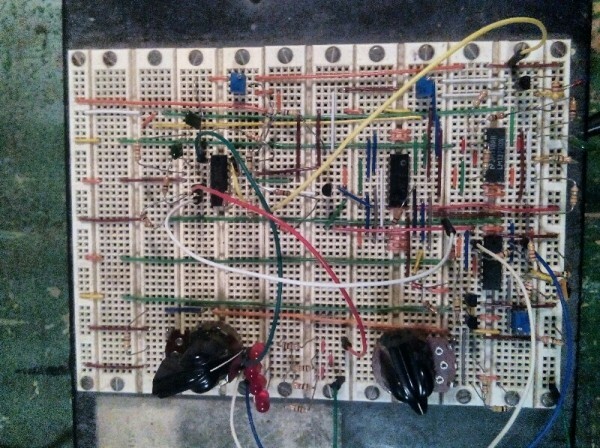 In that he shows how to use an op-amp to make an XOR gate! My thought was to free up an op-amp somewhere and use it to completely jettison the 4001, bringing the chip count down to three. What I found is that the resistor count goes up dramatically, and another transistor is needed. There goes the elegance! And the PCB becomes more complex. Next, I just laid my hand on ten CEM3340 chips and thought one of those might be just the ticket for the VCO portion. But again, the complexity rises elsewhere obviating any benefits. So, my conclusion is that the 2007 design is probably optimal. And, of course, it works very well. Time to leave well enough alone! The 2007 design breadboarded for testing. I wondered if a Thomas Henry really could improve a Thomas Herny design... interesting experiment! BTW i just finished a PCB prototype for your 2007 design. I squeezed it onto a 1.5" x 4" PCB (fits 3U/8HP), so there was no room to provide any luxury as MTA-100 headers for manual wiring or a number of mouting holes. Nevertheless, there is at least one mounting hole, so building this in any given format will be an option - and it provides room for a 2nd timing cap for convenience (range switch anyone? ).